The installation of Septimius Severus as Emperor of the Roman Empire in 193 CE heralded an unprecedented period during which the Roman Empire was guided by a series of powerful women. Coins from the period bear portraits of these women and attest to their importance in the politics of the time. The women featured here include the matriarch Julia Domna, her daughter-in-law Publia Fulvia Plautilla, her elder sister Julia Maesa, Julia Maesa's two daughters Julia Soaemias and Julia Avita Mamaea, and Julia Paula and Aquilia Severa who both married the Emperor Elagabalus, the son of Julia Soaemias. 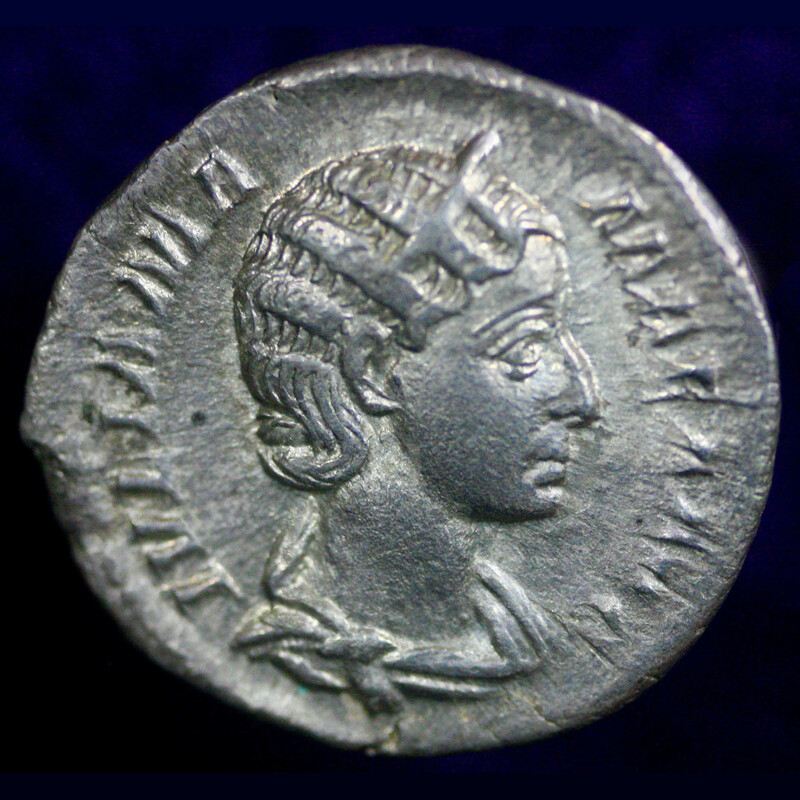 Julia Domna (170-217 CE) was from an extremely wealthy Syrian family. Her father, Julius Bassianus, was of the royal house that ruled the city of Emesa (modern day Homs). He served as high priest to the local cult god Elagabal. According to the Historia Augusta, Septimius Severus married Julia Domna because her horoscope predicted that she would wed an emperor [ 1 ]. 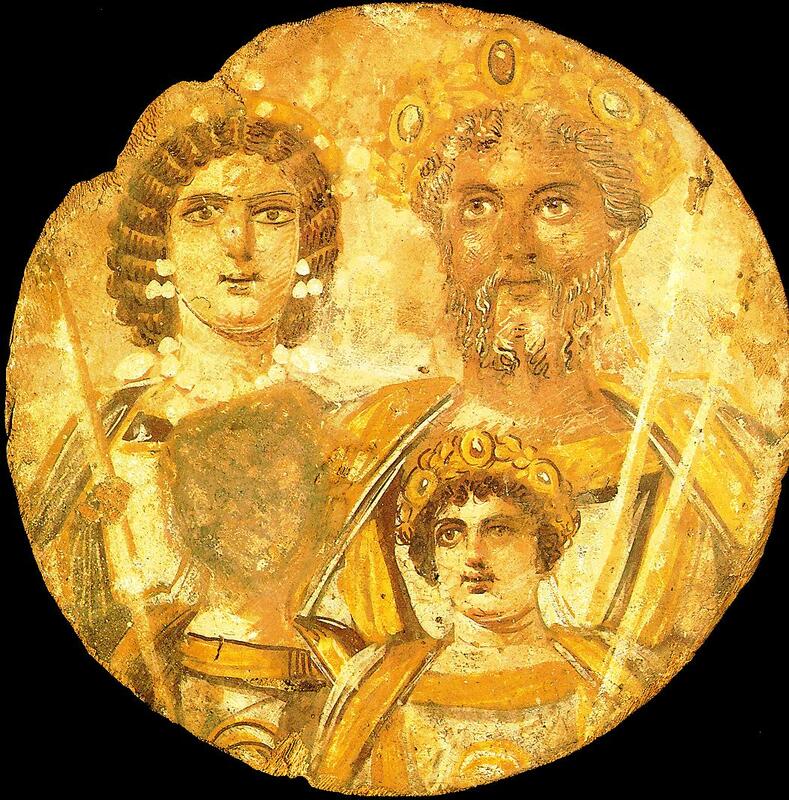 Julia Domna and Septimius Severus had two sons, Lucius Septimius Bassianus (Caracalla) born in Lyons in 188 and Publius Septimius Geta born in 189. When Severus became emperor in 193, Julia Domna accompanied him in his campaigns against rivals such as Pescennius Niger and Clodius Albinus. 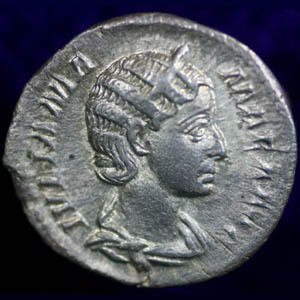 Later, Julia Domna joined Severus in his campaign against the Britons that started in 208. 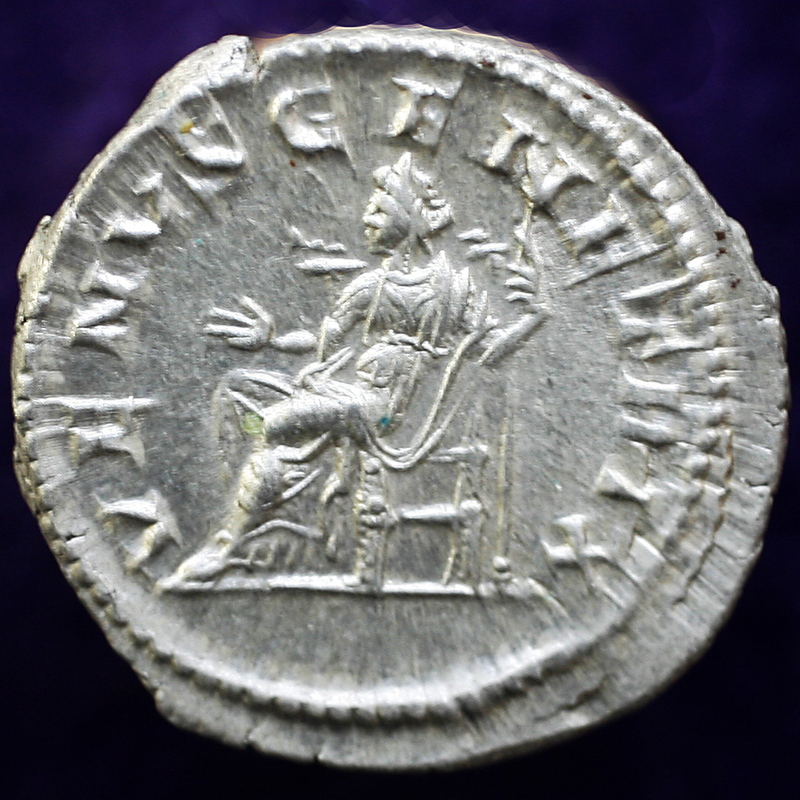 When Severus died in York in 211, his will directed that Caracalla and Geta were to rule as joint emperors. Julia Domna became the mediator between the two sons. After Caracalla had Geta murdered, Julia's relationship with Caracalla became strained but she continued to support him. Julia accompanied Caracalla on his fateful campaign against the Parthian Empire in 217. She died in Antioch shortly after Caracalla was assassinated and Macrinus assumed the emperorship. According to Cassius Dio, at first Julia plotted to wrest control of the Empire from Macrinus for herself; but then, after hearing stories of how much the people in Rome had hated her son Caracalla and were welcoming his demise, Julia refused food to hasten her own death from a preexisting cancer of the breast [ 2 ]. Denarius (silver, 2.90 g). Minted in Rome 216 CE. Obverse: bust of Julia Domna (wife of Septemius Severus) facing right, IULIA PIA FELIX AVG. 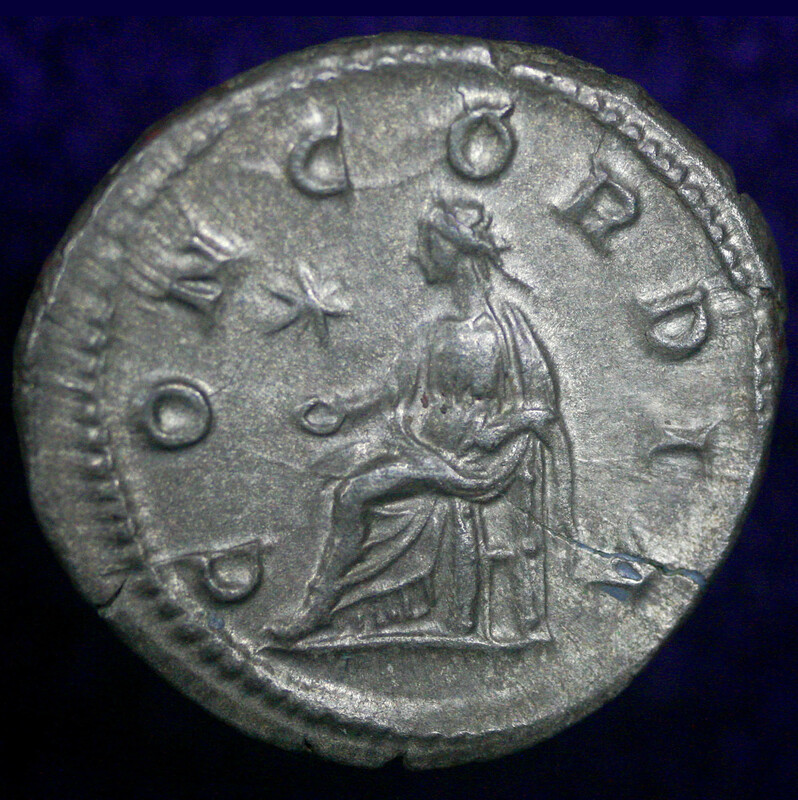 Reverse: Venus enthroned facing left, VENUS GENETRIX. Sear 7106; RIC 388c; BMCRE 434. Photograph by Randy Butler. Publia Fulvia Plautilla was married to her second cousin Caracalla in 202 CE. Although Plautilla came with a magnificent dowry, this arranged marriage between the fourteen year old Caracalla and slightly older Plautilla was not a happy one. Cassius Dio comments that Caracalla despised her and that Plautilla was a shameless profligate [ 3 ]. 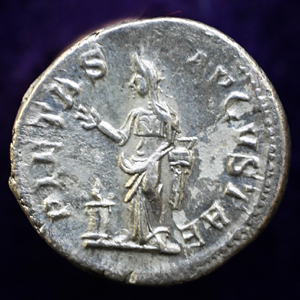 Unfortunately for Plautilla, three years into the marriage her father, Gaius Fulvius Plautianus, one of the wealthiest men in the world, fell from favor with Septimius Severus, He was executed for treachery and his family properties were confiscated. Caracalla immediately divorced Plautilla and she was sent into exile in 205 CE. Caracalla never remarried. Plautilla was strangled on Caracalla's orders shortly after Septimius Severus died in early 211 CE. Denarius (silver, 3.12 g). Minted 202 CE in Rome. Obverse: bust of Publia Fulvia Plautilla facing right, PLAVTILLAE AVGVSTAE. 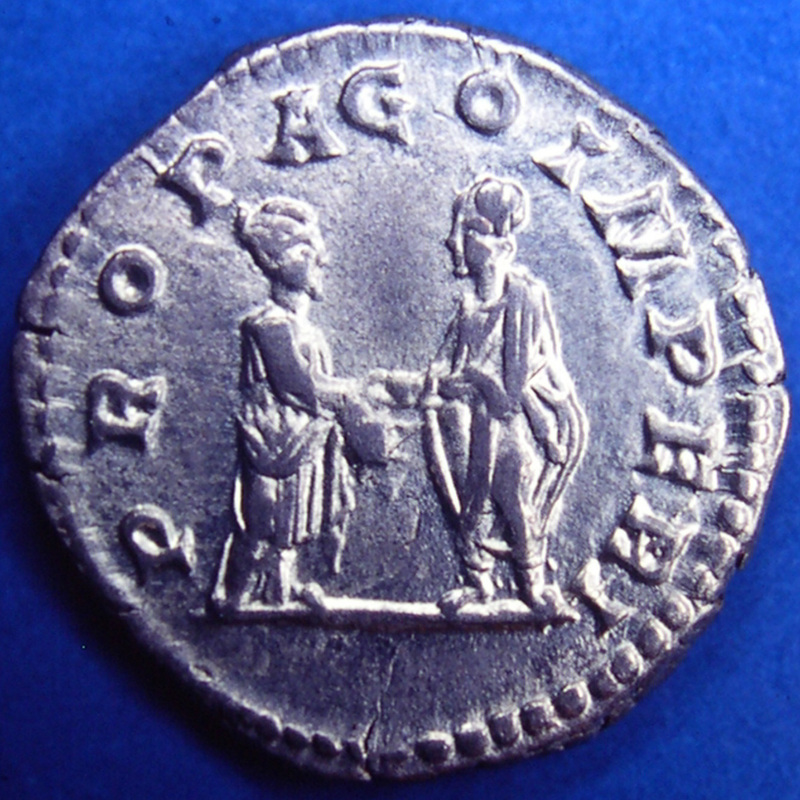 Reverse: Plautilla (left) and Caracalla (right) celebrating their marriage, PROPAGO IMPERI. Sear 7073 (this coin); RIC 362; BMCRE 236. Photograph by Barry Rightman. 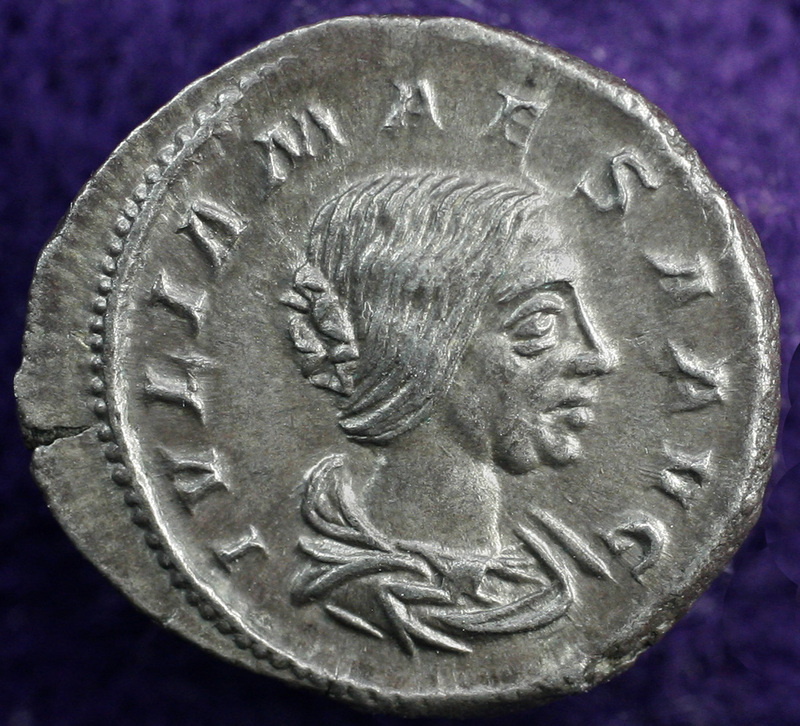 Julia Maesa, Julia Domna's elder sister, was married to a Syrian noble named Julius Avitus. 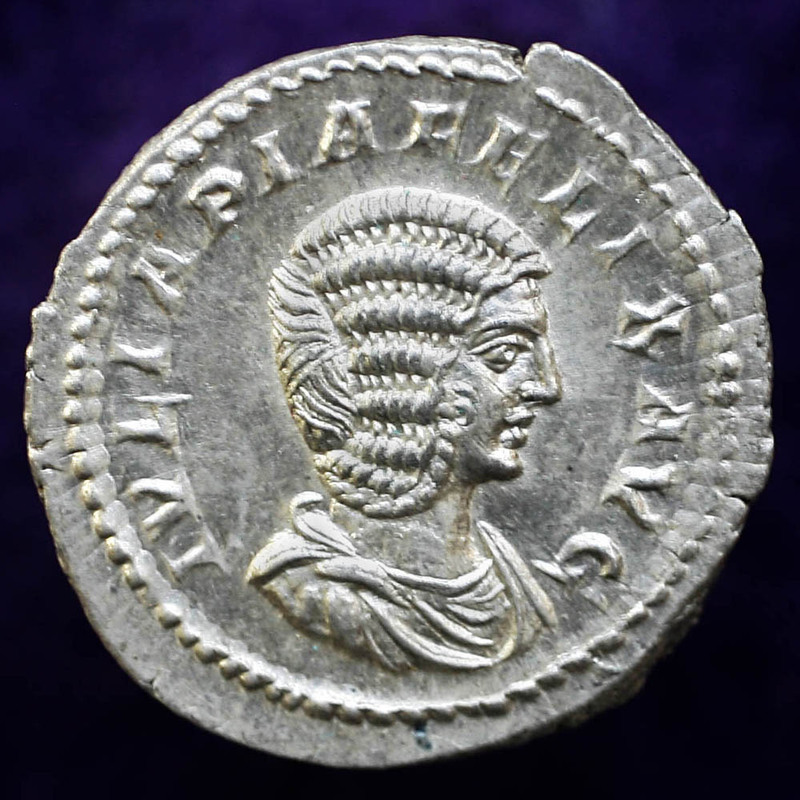 They had two daughters Julia Soaemias (mother of Elagabalus) and Julia Avita Mamaea (mother of Severus Alexander). After the murder of her nephew the Emperor Caracalla and the suicide of her sister Julia Domna, Julia Maesa returned to Syria. There, she instigated a successful plot to eliminate Macrinus and install her grandson Elagabalus as Emperor. Denarius (silver, 3.71 g). Minted 218-220 CE in Rome. 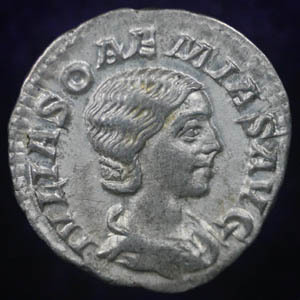 Obverse: bust of Julia Maesa (sister of Julia Domna, mother of Julia Soemias and Julia Mamaea) facing right, IULIA MAESA AVG. 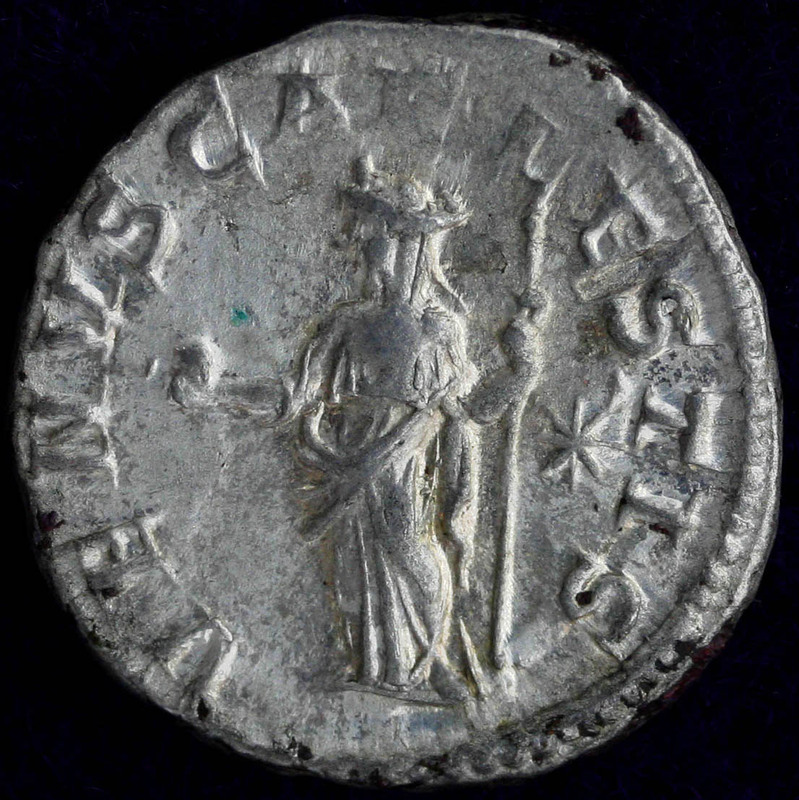 Reverse: Pudicita seated left, drawing out veil from shoulder with right hand and holding sceptre in left hand, PUDICITA. Sear 7756; RIC 268; BMCRE 76. Photograph by Randy Butler. Julia Soaemias Bassiana (180-222 CE) was the elder daughter of Julia Maesa and Gaius Julius Avitus Alexianus. She was the mother of the Emperor Elagabalus. When her cousin, Caracalla, was killed in 217 and Macrinus ascended to the imperial throne, Julia and her mother plotted to replace Macrinus with her second son, Bassianus. Julia and her mother spread the rumor that the thirteen-year-old boy was Caracalla's illegitimate son. 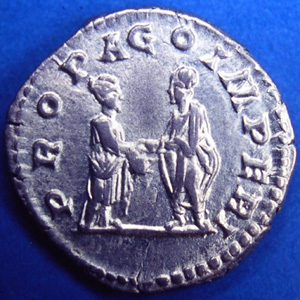 In 218 Macrinus was killed and Bassianus became emperor with the name of Elagabalus. Since Elagabalus was a minor, Julia became the de facto ruler of Rome. Denarius (silver, 2.72 g). Minted 220-222 CE in Rome. 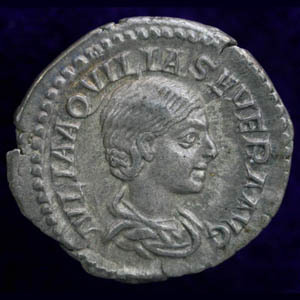 Obverse: bust of Julia Soemias (mother of Elagabalus) facing right, IULIA SOAEMIAS AVG. Reverse: Venus standing holding apple and scepter, VENUS CAELESTIS. Sear 7719; RIC 241; BMCRE 49. Photograph by Randy Butler. 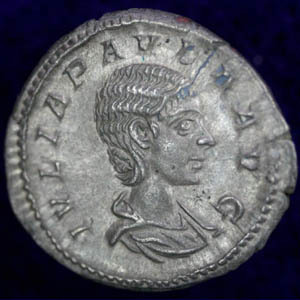 Julia Cornelia Paula was the first wife of the Emperor Elagabalus. Elagabalus married her in 219 CE shortly after he had arrived in Rome. Julia Paula belonged to an ancient and wealthy aristocratic family. 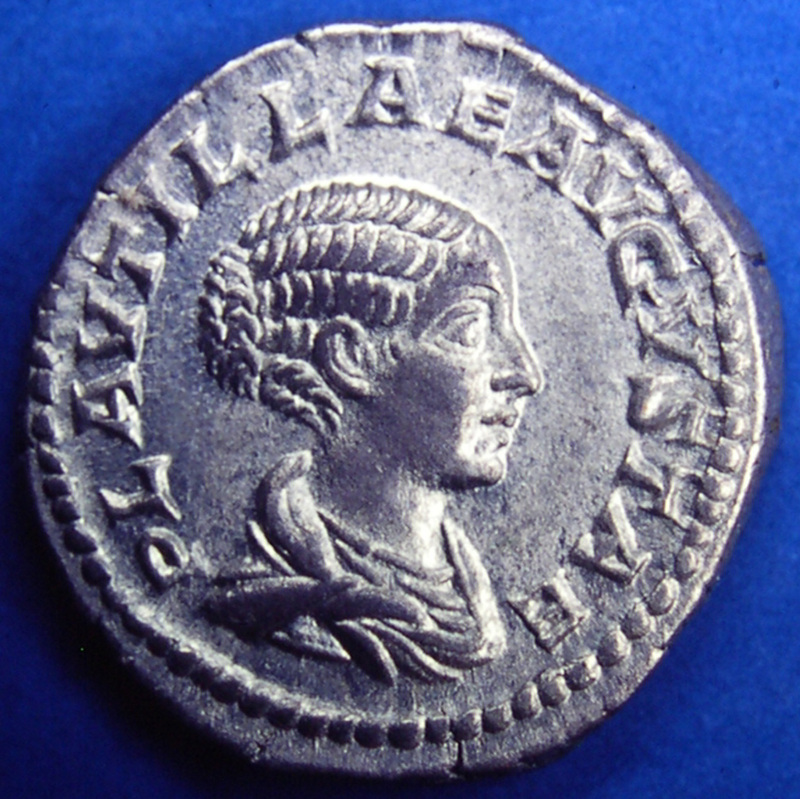 Elagabalus divorced her in 220 CE so that he could marry Julia Aquilia Severa. 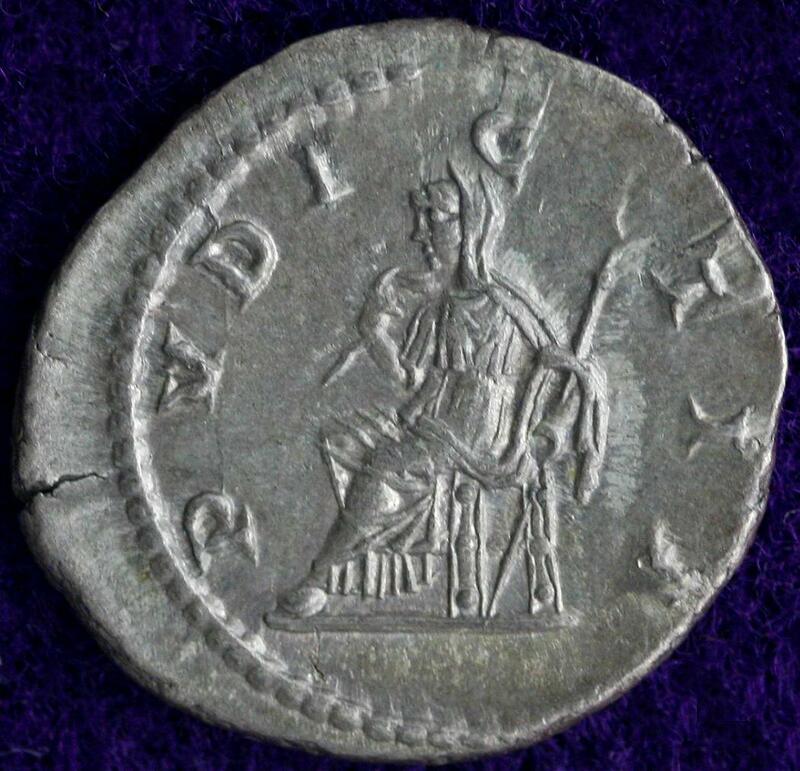 Denarius (silver, 3.34 g). Minted 220 CE in Rome. 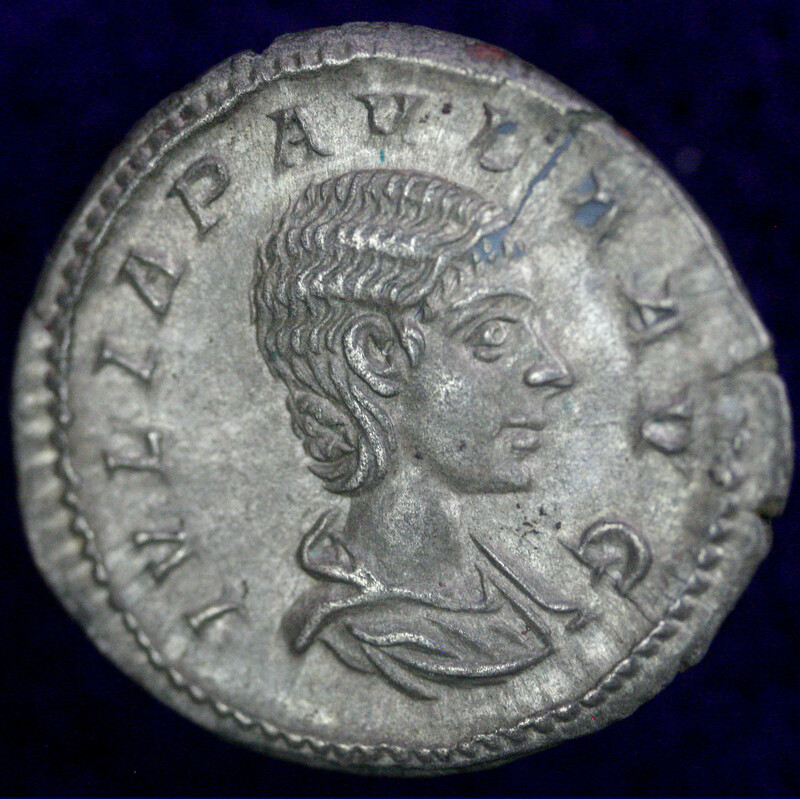 Obverse: draped bust of Julia Paula (first wife of Elagabalus) facing right, IULIA PAVLA AVG. 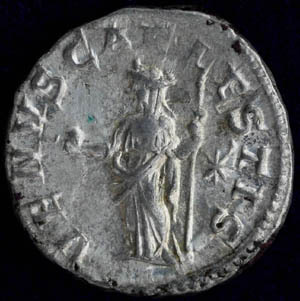 Reverse: Concordia enthroned left holding patera and resting left arm on throne, star in field, CONCORDIA. Sear 7655; RIC 211; BMCRE 172. Photograph by Randy Butler. Julia Aquilia Severa, was the second (and fourth!) 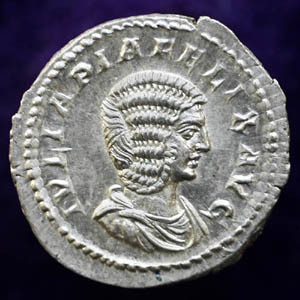 wife of Emperor Elagabalus. Because Julia Aquilia Severa was a Vestal Virgin this was a scandalous act. Denarius (silver, 2.91 g). 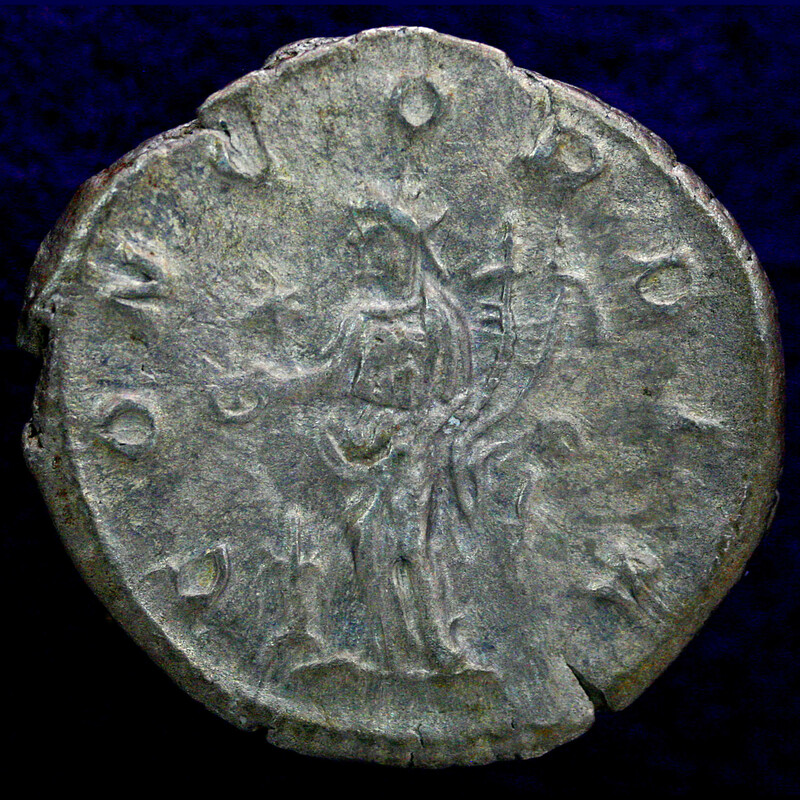 Minted 221 CE in Rome. Obverse: draped bust of Aquilia Severa facing right, IULIA AQVILIA SEVERA AVG. Reverse: Concordia standing left, sacrificing over lighted altar and holding double cornucopia, star in right field, CONCORDIA. Sear 7679; RIC 226; BMCRE 184. Photograph by Randy Butler. 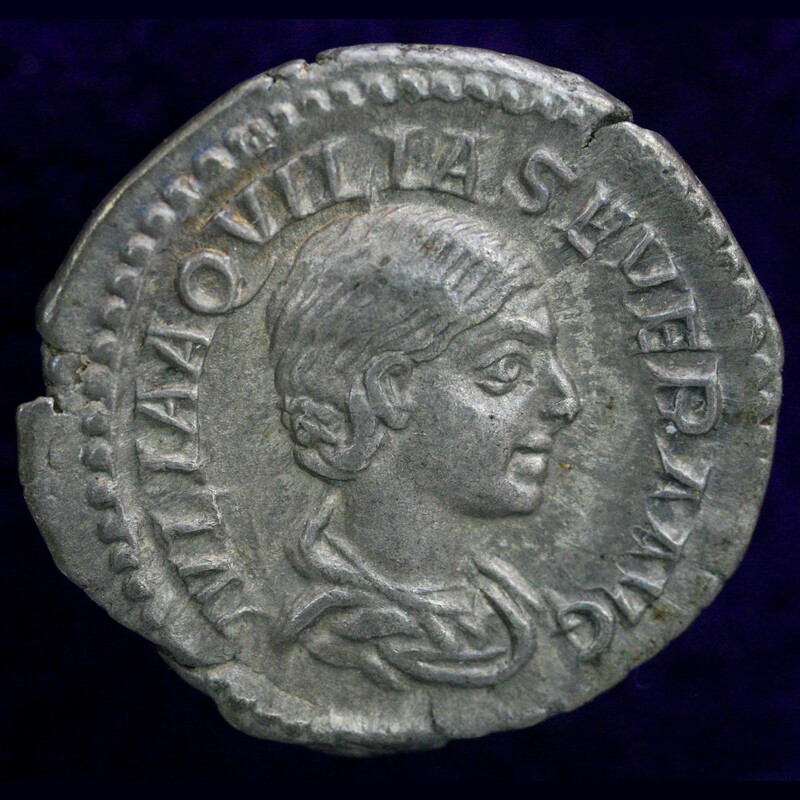 Julia Avita Mamaea was the mother of Severus Alexander, the last Emperor of the Severan dynasty. Julia Maesa convinced her grandson, the Emperor Elagabalus, to adopt her other fourteen year-old grandson Alexander Severus as his heir shortly before Elagabalus and his mother Julia Soaemias were murdered by the Praetorian Guard. Alexander Severus was acclaimed emperor and ruled from 222-235 CE. Julia Avita Mamaea and her mother became regents for Alexander. Denarius (silver, 2.90 g). 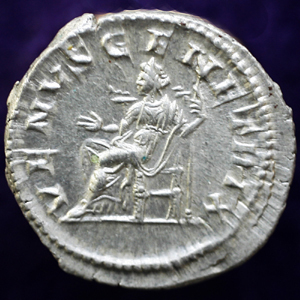 Minted 231 CE in Rome. 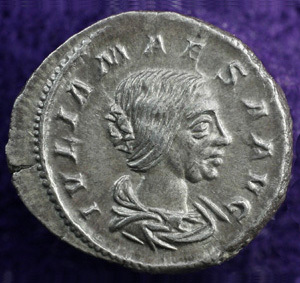 Obverse: diademed bust of Julia Mamaea (mother of Severus Alexander) facing right, IULIA MAMAEA AVG. Reverse: Pietas standing left, sacrificing over altar and holding box of incense, PIETAS AUGUSTAE. Sear 8213; RIC 346; BMCRE 821. Photograph by Randy Butler. Pudicitia and Concordia. In Roman mythology, Pudicitia was the personification of modesty and chastity; Concordia, the goddess of agreement, understanding, and marital harmony. There use on these coins appears to be promotional propaganda. 1. Life of Septimius Severus. Historia Augusta at LacusCurtius: Latin text and English translation. 2. Cassius Dio. Roman History. Book LXXIX. 3. Cassius Dio. Roman History. Book LXXVII. Turton, G. 1974. The Syrian Princesses: The Women Who Ruled Rome A.D. 193-235. Cassell & Co., London. 209 pp.